The best bond manager on the planet is pounding the table about these “slam dunk” income plays. Bank 8%, 8.4% and 11% annual dividends, paid monthly, with 7-15% additional price upside. And with their gaudy 8-11% payouts, we’re talking about gains of 8% to 31% over the next 12 months! I’m a bit more conservative – anticipating gains that are “only” between 16% and 25% over the next year. That’s still a pretty good stock tip from the world’s smartest income investor. The real kicker is, he likes these issues no matter which way the S&P 500 turns. Most individual investors aren’t very familiar with the closed-ends that billionaire “Bond God” Jeffrey Gundlach likes so much. I’ll explain more in a minute – and also share my three favorite buys in the space today. But first, let’s talk about the difference between a mere Bond King, and an outright Bond God. He’s lorded over the fixed income market for decades from his perch as the boss and Chief Investment Officer at PIMCO. As recently as two years ago, his firm was the toast of fixed income. They managed over $2 trillion in assets. Everyone wanted to invest with Gross. 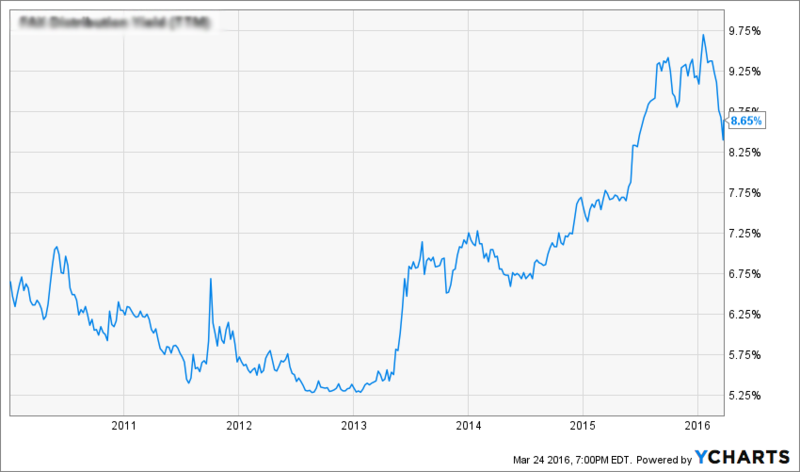 In recent years though, the Bond King’s crown has slowly faded. His performance slipped. Of course, Gross didn’t forget how to invest in fixed income. The fact of the matter is that he gradually got weighed down by his own success, and the money it attracted. Warren Buffett himself has said that it’s easy to invest $1 million and net big returns, but when investing $1 billion one has far fewer opportunities. Imagine trying to deploy a trillion or two effectively? Eventually, the firm Gross co-founded more than four decades earlier appeared ready to move on without him. Not only were his returns down, but also personal tensions with his fellow managers were at breaking points. His peers figured they could get on just as well without him. Gross knew he was working on borrowed time. The King was in need of a new throne! So he drove a few hours up the freeway to Santa Monica to the 13,000-square-foot mansion of the best bond guy he knew – and asked for work. “I am Kobe Bryant. You are LeBron James,” Gross told Gundlach. “I have five rings, you have two – probably going to five,” he clumsily made an NBA championship analogy regarding his peer’s potential. Gross wanted to bring his PIMCO “rings” to DoubleLine Capital, the firm Gundlach co-founded in 2010. What a flattering compliment – you’re great, and with my help you can equal my greatness. Eventually. Probably. But Gundlach was sick of being disrespected. Morningstar had previously named Gross its “Fixed Income Manager of the Decade” – even though the younger prodigy beat his rival’s performance over that 10-year period! But that snub was overshadowed by a larger slight. In December 2009, Gundlach was pushed out by his own firm! Trouble had been brewing since 2001, when a large bank acquired his boutique and reduced his ownership stake without permission. When things finally boiled over Gundlach left and took his favorite employees with him. He immediately launched DoubleLine – where his flagship fund produced 8.4% annual returns over the next five years. That nearly doubled up the 4.5% returned by the Barclays U.S. Aggregate Index over the same time period. And led him eventually to $85 billion in assets. Gundlach didn’t need Gross. He made it clear he’d stay in full control of the firm, and there would be no power share. They agreed to keep the dialogue open… but there was no follow up chat. One week later, Gross departed PIMCO unceremoniously for lesser-known rival Janus Capital. The Bond King was no longer fixed income’s figurehead. Barron’s even ditched him from its famous roundtable in favor of Gundlach. In 2011, he predicted a big rally in U.S. Treasuries when rates were already near 30-year lows (and Bill Gross was predicting otherwise). Rates dropped in half again over the next year as bond prices skyrocketed. 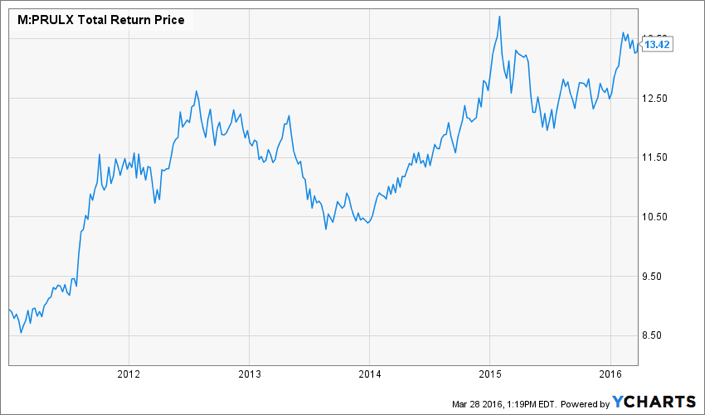 In 2014, he called a rally in the U.S. dollar when most pundits were predicting its demise – and the buck soon rallied 20%. Gundlach’s out-of-favor wagers help him counter the drag of the increasingly large pile of money he manages ($85 billion and growing). His investors give him their capital and let him work his magic – which means he’s free to scour the globe and invest in his best fixed income ideas. Now, Gundlach’s strategy is a sophisticated one that shouldn’t directly be replicated at home by you or me. Most of his portfolios are invested in securities that are below investment grade or not rated at all. But we can invest as Gundlach would and hire an expert of his caliber – and even the Bond God himself – with a “single-click” via the closed-ends that he spoke so glowingly about. An open-end fund, on the other hand – commonly called a mutual fund – issues as many shares as investors want to buy. “Closed-ends are one of the best plays on the Fed not raising interest rates. Investors have been afraid to own them because they fear that the Fed has launched a tightening cycle. I love watching closed-end fund discounts because they’re clear contrarian indicators. The more investors dislike a strategy at the moment, the greater the discount they demand. The irony is that most people love chasing recent performance, which means they’re most inclined to sell a loser at the moment it’s most likely to turn around. Like Gundlach, I haven’t been this excited about an income opportunity in years. And we’re actually in a better position than the Bond God. He can buy whatever bonds he wants, but he can’t claim the discount you and I get when we buy a closed-end fund. Buy #1 is a backdoor way to purchase the greatest infrastructure companies in the world at a bargain price. As you know, America’s infrastructure is crumbling after decades of neglect and underinvestment. The American Society of Civil Engineers graded the current state of roads, ports, power plants and water treatment a “D+” in aggregate. There are few bright spots, with the ASCE estimating $3.6 trillion will need to be invested by 2020 for upgrades. No matter what happens next in Washington, America will need to up its investment in infrastructure. 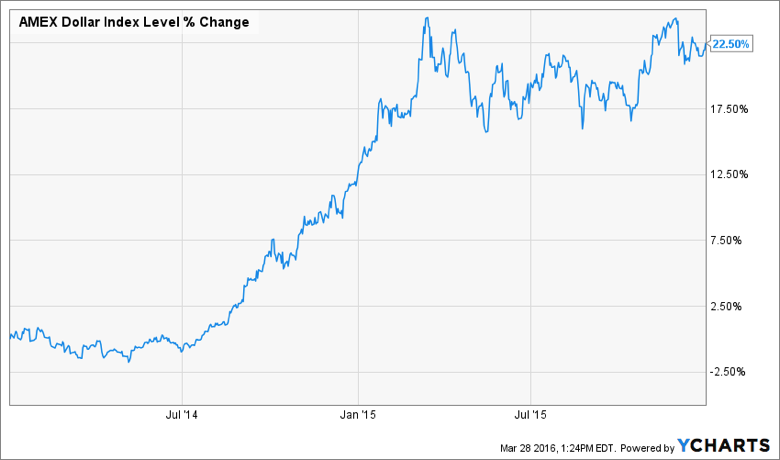 This fund is riding a bullish trend that will continue for decades, at least. But it’s trading at a 14% discount to the value of the assets it holds! In a knee-jerk reaction, “first-level” investor types have sold this fund along with other energy stocks. But it doesn’t loan money to energy producers – it buys stocks and bonds in the top infrastructure companies in the world. And these holdings are constantly marked to market, so there’s no reason for the fund to trade at such a steep discount. That’s good news for us – we can make a “one-click” purchase for 86 cents on the dollar. In return, we’ll collect income from utilities, airports, toll roads, railroads, and other physical framework around the world. We’ll get paid every single month and collect an 8.2% yield at current prices. The fund’s top holding is Crown Castle International, the largest provider of wireless cell towers in the U.S. Number two is National Grid, a British electric and gas utility. And rounding out the top three is Transurban Group, a toll road developer that operates in Australia and America. Over the past twelve months, these stocks have gained 6.8%, 13.9% and 21.8% while the S&P 500 has dropped 1.2%. They should continue to outperform in the years ahead. Together, these stocks pay an average yield of 4.1%. But we can actually double our payout – and capture more upside, too – simply by buying this fund. Reason being, the fund’s investment managers have access to preferred stock shares that pay even higher yields than the common stock shares you and I see quoted. These preferred shares generally aren’t available to retail investors like you and me – but we can buy a basket of them with a single-click by picking up this high-yielding virtual toll bridge. Plus, the fund’s 14% discount will close in the months ahead, providing us with “instant upside” on top of our secure 8.2% dividend. Buy #2 has double contrarian appeal. Investors ditched it throughout 2015, concerned the Fed was about to embark on a sustained rate raising campaign (which, of course, never materialized). Then, to kick off 2016, these headline-fearing folks avoided anything they perceived to be tied to China. In fact, they sold this fund simply because it has “Asia” in its name! These dual panics are the reason fund trades at a 12% discount to its underlying assets. Given its steep sale price, you’d think it’s holding the debt of some obscure Chinese companies. But that couldn’t be any farther from the truth. 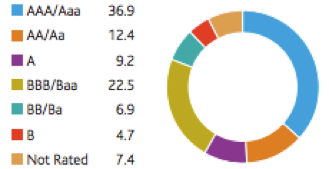 It actually holds safe government bonds in financially-stable sovereigns such as Australia, India, and Korea! Best part is, management buys its own dips, too. Since 2001 it’s helped its own cause by repurchasing shares when they’re trading at a steep discount to NAV. It has ongoing board approval to buy back up to 10% of its outstanding shares of common stock during any 12-month period. I expect they’ll continue to do so as long as the fund is trading at a 10%+ discount to NAV. Which means it’s smart to buy shares alongside management today. You’ll collect a secure 8.4% yield, with an additional 12% in upside potential as its discount window narrows. Finally we have an 11.3% yield brought to us by the Bond God himself – with 8% upside to boot. We’ve talked a lot about discounts – there is a flipside. Premiums exist, but they are rare in the closed-end space. And usually reserved for “rock star” managers and hot ideas. For example, PIMCO’s funds would often trade at a premium when Gross was running the show. In fact, three still do trade at double-digit premiums, with the most excessive above 80% today. Yes, you read right – there are people who pay $1.80 for $1.00 to invest with the ghost of Gross! In 2012, DoubleLine launched a closed-end of its own. Not surprisingly, it trades for a 17% premium to its NAV today. Investors, in other words are paying $1.17 for $1.00 just to get in with the Bond God. As you know, the investing odds are against you when you run with the crowd with a popular trade. But there’s actually a contrarian income opportunity in DoubleLine’s second, lesser known fund. You see, this “stepchild” fund launched at an unlucky time – when investors fretted about the possibility of higher rates. Thanks to initial interest rate paranoia, it actually trades at an 8% discount to NAV – even though it’s managed by the same team and provides the same flexibility for them to invest in their best fixed income ideas. Even better, this “other” DoubleLine fund pays a whopping 11% yield after fees! The “smart money” is no longer worried about rising interest rates. The Fed Fund futures market is betting on only one rate hike between now and next summer. As a result, investors are starting to buy up the Bond God’s other fund. I expect the 8% discount window to close quickly – which will give new investors total gains of 19% over the next 12 months. It’s only a matter of time before other income investors ditch their paltry 2% and 3% payers and find their way over to “slam dunk” income plays. The global infrastructure play that pays 8.2% annually and sells at a 14% discount to net asset value (NAV). 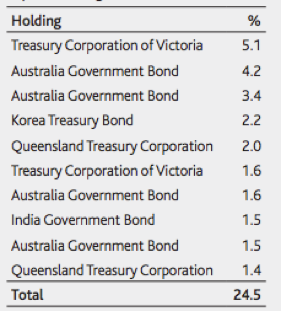 The safe play on secure Asian and Australian government bonds that pays 8.7% and sells at a 12% discount to NAV. The brainchild of the Bond God himself that pays 11.3% and sells at a 7% discount to NAV. You’ll get the rationale behind where, why and how to profit. In short, everything you need to know about these stocks before you invest a single penny. 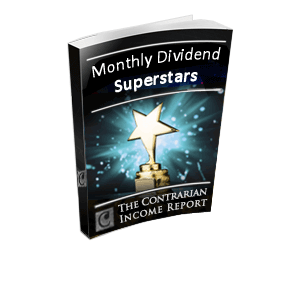 To get your copy of Monthly Dividend Superstars: 8-11% Yields with 15% Upside at no cost whatsoever, I simply ask that you take a risk-free trial of my research service, The Contrarian Income Report. 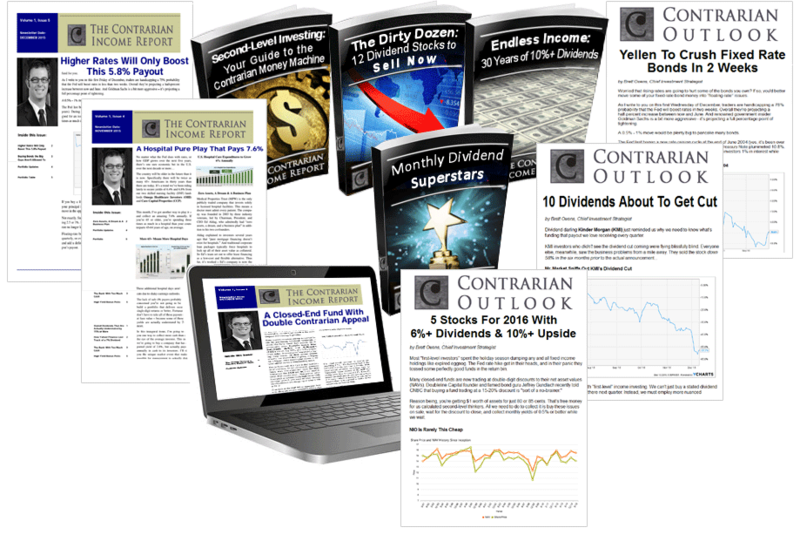 Every investment I recommend pays 6% or better, including three funds in our portfolio that each deliver over 8% dividends right now – and they pay out monthly. As I write this, my five favorite “best buys” are paying between 6% and 11% and our entire portfolio sports an average yield of 7.4%! Meanwhile, the S&P 500 pays a meager 2.5% on average, and the 10-year Treasury bond barely 2%. 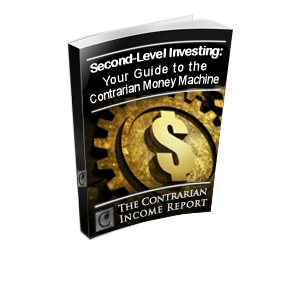 Most investors could double – or even triple – their income overnight! Imagine 7%, 8%, even 11% dividends rolling in from these funds, and then watching them appreciate as mainstream investors realize what they’ve been missing and inevitably pile back in. Three of my other favorite recommendations right now were unfairly beaten down following the Fed’s December rate hike by short-sighted investors who failed to look beyond the headlines. In reality, they are well supported by strong balance sheets, growing cash flows, and a major catalyst that most investors (including Wall Street) have overlooked. There are 77 million Baby Boomers who just started retiring. Roughly 10,000 of them will turn 65 every single day for the next 15 years. We are living longer than ever but require more care in the process. The 85+ population will triple over the next 30 years. A rock-solid 7% payer with accelerating dividend growth rate. Healthcare spending is projected to rise to $5.43 trillion by 2024, and few companies are as well positioned as these to deliver consistent, growing income right now and for the next 3 decades. 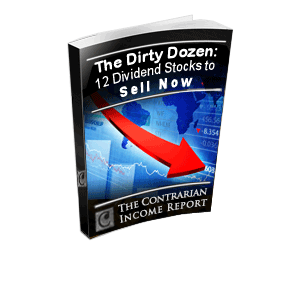 This report gives the rationale behind where, why and how to profit, everything you need to know about these companies before you invest a single penny. In the meantime, our closed-end funds will shower shareholders with 8% to 11% dividends and 15% gains in the next 12 months. 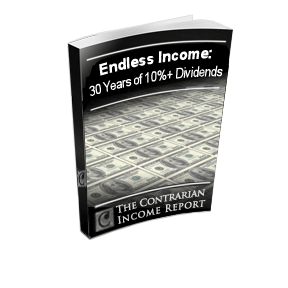 And our other Contrarian Income Report portfolio plays will continue delivering additional 6%, 7%, even 9%+ yields to subscribers. P.S. Since my recommendations are contrary to prevailing popular beliefs, they have a habit of rallying quickly as soon as the Wall Street crew realizes they are missing out. I encourage you to get started right now so that you can get in at a good price! P.P.S. Remember, your risk-free membership comes with the full details on our top 3 closed-end funds paying 8-11% and the 7.5% dividends from the healthcare plays set to double. Even a small position in any one of these picks will easily cover a full year’s membership… most likely before your 60 day trial even ends!